The textile and apparel industry constitutes the largest global manufacturing employer with approximately 200 nations involved in production resulting in $313.5 billion in trade during 1996. Of this amount, $163.3 billion was derived from apparel, the tenth largest trade category in the world. The apparel industry comprises many small but interrelated firms. Making garments to sell as ready-to-wear is labor intensive but to initiate production requires less capital investment and less advanced technology than many other businesses. Women constitute the majority of the labor force worldwide and have found apparel a continuing source of employment throughout history. These factors have made the business of ready-to-wear clothing of particular importance to the economies of developing nations in the twentieth and early twenty-first centuries, and to entrepreneurs in many earlier eras. The illustrated chart shows the relationships of the many associated firms involved in the production of all price levels of ready-to-wear. In the modern industry, these firms are located in many different parts of the world. Thus production emphasis is now placed on the coordination and logistics of each aspect of the process. There are four aspects of ready-to-wear with historic antecedents that remain important businesses in the twenty-first century. The most common is the speculative production of fashionable garments to be sold at retail as described in the chart. Secondly, commissioned garment production, for example military uniforms, differs from speculative production in the nature of financial risk because there is no need to sell at retail. Thirdly, the used-clothing market has traditionally been a ready-made clothing source for the poor. However, the enormous growth of used clothing as a viable and expanding business in the late twentieth and early twenty-first centuries is notable for the breadth of its market, which reaches almost all socioeconomic levels through resale and thrift shops as well as auctions. Due in part to the relaxation of standards of dress, in part to popular culture and in part to affluence in the last quarter of the twentieth century, used clothing is an important sector of the current ready-to-wear market. Firms that provide services for international trade via shipping and logistics constitute a fourth important and profitable aspect, especially because of the decentralization of the modern industry. Speculative production began in antiquity with garments and accessories traded internationally. For example, ready-to-wear was part of ancient Babylonian business life as recorded on clay tablets dating from 1400 to 1200 B.C.E. A merchant there wrote to his associates to instruct them to open his warehouse, take out garments from his sealed chests and from the chests of garments returned to him by another merchant. He instructed them to "Write your tablets as follows: they have taken so-and-so many garments from the chest, so-and-so many from the regular deliveries have not been received, so-and-so many are from the garments returned to me- and send all the tablets to me" (Oppenheim, p. 85). These instructions are not unlike inventories taken in modern industry. Speculative production requires capital investment and the ability to assume the risks inherent in recouping investment through the sale of merchandise at a profit. In the pre-industrial era such production included useful but semi-fitted garments. After 1350, as clothing became more fitted, shirts and accessories such as collars, hair nets, hats, and gloves became the primary kinds of products traded. In Renaissance Florence, embroidered detachable sleeves could be purchased ready-made and were also exported. London customs records for the second half of the sixteenth century show gloves from Belgium, Spain, and Italy imported by the gross; hair nets, straw hats, and caps from France by the dozen; as well as knitted nightcaps, gloves, stockings, and petticoats. Sixteenth-century London silkwomen, who processed imported raw silk from Italy into thread, could weave ribbons and other trimmings to make silk accessories which they sold in their own shops along with imported silk items, such as hair nets, netted neckwear, and netted sleeves. Elsewhere, women did most of the work of making small accessories, and such products were ordered and sold through men's trade guilds. Commissions were given for the provisioning of armies, household retainers, or charitable donations. In ancient Rome records indicate that garments were produced in factory-like settings with perhaps 100 workers, and that some early form of mass production outfitted the Roman legions. Commissions also feature in later European religious rituals and charitable donations. For example, in the annual Maundy Thursday foot-washing ceremony, Elizabeth I of England (1533-1603) provided a woolen gown, a pair of shoes, and a smock-mass produced at her expense-to as many women as equaled the years of the queen's age. In another sixteenth-century example, a wealthy citizen of Nuremberg, Germany, provided in his will of 1577 that each year on 31 October, 100 poor men would be provided with a coat, waistcoat, and trousers of black wool, a black hat, a white linen shirt, and a pair of shoes. This particular donation continued until 1809 and required two master tailors and their journeymen to use specific patterns, standard measures, and materials purchased from specified vendors, requirements similar to practices in twenty-first century ready- to-wear. Wealthy individuals might also provide in their wills for mourning clothes to be made and given to mourners at their funerals. By far the most widespread and common source of ready- to-wear clothing in the pre-industrial era was the used clothing market. Throughout Europe records beginning in the Middle Ages document dealers in used clothing, often women, who supplied many in the lower socioeconomic levels for whom new clothing was too expensive. Used clothing dealers sometimes rented stalls in market areas designated for their trade, or simply sold their wares on the streets. A retail guild including dealers in secondhand clothing was organized in Florence, Italy, in 1266. The necessity for having used clothing available is apparent in the following examples from Nuremberg, Germany, in 1509 where a new coat given to a servant girl by her employer was equal to 56 percent of her annual income, and the fabric provided for a servant's coat and trousers was 148 percent of his annual wage. Some members of the upper classes also purchased used clothing, most of which was acquired by dealers at estate sales. During plague years, when there was fear of infection, used clothing markets were closed. International trade in ready-to-wear garments and accessories increased as other regions of the world opened to European business in the sixteenth century. By the seventeenth century some larger ready-made garments, such as the banyan or Indian gown for men, and the mantua for women, were imported to Europe. Both were T-shaped garments similar to caftans, and were considered informal dress. The first merchant ship to fly the flag of the United States, The Empress of China, sailed for the Orient in 1784. Its cargo of Virginia ginseng was traded at Canton, China, for porcelains and soft goods including ready-made umbrellas, 600 pairs of ladies' mitts; six pairs of ladies' satin shoes, more than 250 pairs of men's satin breeches, and a large number of textiles. On the second voyage in 1786, the ship returned with similar wares that included more than 600 pairs of satin breeches. These cargos were consigned to merchants who advertised the contents up and down the east coast of the United States. Bristol, England, had more than 200 merchant houses trading internationally by the late eighteenth century, exporting felt hats, worsted caps, stockings, hosiery, footwear, and wearing apparel such as canvas frocks, trousers, shirts, jackets, and drawers. As part of the slave trade, this kind of ready-made clothing was traded in Africa to buy slaves and sold in America and the West Indies to provide clothing for slaves. Similar ill-fitting loose clothing was provided for sailors and was known as slops. Merchant tailors, long prevented from making clothing on speculation because of guild restrictions and lack of capital, began to work in mass production during the nineteenth century. Systems of standardized and proportional measurements enabled them to make better fitting ready-to-wear at more affordable prices. The introduction by 1820 of a tape measure marked in inches made more standardization possible. Statistics kept for soldiers in the American Civil War helped determine how men's measurements could be better adapted for mass production. Ebeneezer Butterick's 1863 patent for the sized paper pattern provided increased standardization for women's garments. 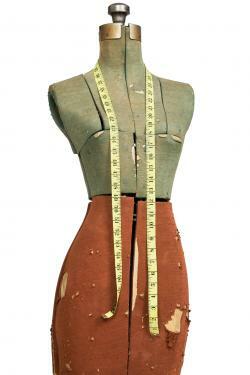 During the first half of the nineteenth century, mass produced ready-to-wear clothing was almost exclusively for men. Only mantles and cloaks with little fit were produced for women. In the early years of industrialization, labor costs remained cheaper than fabric, with women and boys doing much of the sewing by hand at home while the pattern making, cutting, and inspection of finished goods were under the supervision of the tailor in his shop. At the end of the nineteenth century, immigrants met the growing need for labor. Many arriving with tailoring and dressmaking skills found work producing ready-to-wear in New York City, the center of the American ready-to-wear industry. The first technological innovation impacting industrial garment making directly was the sewing machine. Following developments by Elias Howe and Isaac Singer among others, Nathan Wheeler and Allen B. Wilson made and marketed a machine clothing manufacturers found efficient because it allowed fabric to feed evenly on curved seams. The sewing machine made possible the piecework concept of factory organization where each step was performed by a different person, eliminating the need for skilled workers. Steam-powered sewing machines in factory work-rooms were used from the early 1850s to produce men's shirts and collars, and were then adapted for the production of suits for men and boys. Overcoats of heavy cloth could be sewn by machine in three days instead of six by hand. The business of women's cloaks and mantles as well as crinolines and hooped petticoats was improved by the use of the sewing machine, and consequently these items became cheaper when ready-made. Women's fashions using braids and trimmings increased as machines made the application easier. Improvements to the sewing machine continued, with 7,339 patents for sewing machines and accessories granted between 1842 and 1895. Technologies for cutting and pressing were the last fundamental industrial processes to be developed. The most successful mechanism for cutting multiple layers of cloth arrived in 1890, and the modern pressing machine was developed in the first years of the twentieth century. The nature of clothing distribution changed in the second half of the nineteenth century with the creation of department stores in large urban centers in Europe and North America. With these stores came greater variety for the consumer and the advent of advertising to influence choice. Department stores appeared in the early 1850s, and, by the end of the century had become enormous architectural wonders that encompassed many kinds of merchandise including ready-made garments for men, women, and children. Although these large stores offered products through illustrated catalogs, their focus was on the urban population. In the United States, Aaron Montgomery Ward established a mail-order business in 1872 offering to furnish "Farmers and Mechanics throughout the Northwest with all kinds of Merchandise at Wholesale Prices." Sears, Roebuck and Company followed in 1893. By 1920, Ward's catalog had grown from a single sheet to 872 pages, and Sears' 1921 edition was 1,064 pages with the first 96 pages devoted to women's clothing, followed by 40 pages for men and boys. In addition to illustrated catalogs, women's magazines, first appearing in Europe at the end of the eighteenth century, proliferated throughout the nineteenth century. Initially limited fashion coverage focused on illustrations featuring the latest fashions, their materials and colors, and sometimes the providers. By the end of the nineteenth century, more pages were given over to product advertisements. By the 1920s mass production and mass merchandising were fully integrated into the ready-to-wear industry. The focus of advertising had shifted from declarations of quality to exhortations urging readers to keep up with fashion, and from an emphasis on men's wear to one on women's wear. This gave impetus to the modern industry's strategy of rapid fashion change. The women's ready-to-wear industry in the United States became concentrated in New York City between Sixth Avenue and Ninth Avenue from 35th Street to 41st Street, where 65 percent of the women's garment workers were employed by 1940. The proximity of manufacturers to labor and suppliers as well as associated businesses gave New York firms the flexibility to react quickly and efficiently to changing fashions. Employment in the domestic American apparel industry peaked in 1950 at 1.4 million. Jerry Silverman, Inc., a manufacturer of women's better dresses, organized in 1959, provides an example of typical production processes. In 1970 Silverman sold dresses at wholesale from $39.75 to $89.75 to about 3,000 stores nationwide, where they cost the consumer from $70 to $175. Not including CMT (cut, make, trim) contractors, the firm employed about eighty people. Shannon Rodgers, the firm's designer, had his name on the label, an unusual acknowledgment when most designers working for manufacturers remain anonymous. To develop a concept for his ready-to-wear line in a given season, Rodgers went to Europe to view collections. The industry in the United States usually depends on Parisian fashion ideas, especially for silhouette and color. However, the complex and detailed French haute couture (fine, luxurious made-to-order clothing) cannot be directly copied for ready-to-wear garments intended to fit thousands of consumers. Rodgers was skilled at taking single elements of a haute couture design, for example, a skirt detail, a neckline treatment, or a sleeve style, and incorporating them into various garments, getting perhaps six ready-to-wear ideas from a single haute couture garment. These trips also gave Rodgers ideas for fabric choices that would give the finished garment the texture, volume, and movement he envisioned. After sketches for the line were completed, fabrics and trimmings were purchased and a sample produced in company workrooms. Once the sample had been approved, it was sent to the pattern maker, graded into various sizes, and sent out to be duplicated for fashion show and showroom use. The Silverman fashion show for retail buyers and the fashion press usually featured about 100 different styles. Initial orders from buyers were confirmed after approval from the stores they represented. The success of the business depended on the quantity of confirmed orders and timely delivery-first of the fabrics and trimmings for production and then of the finished garments to the stores-as well as keeping production costs minimized. Outside contractors cut the garments, bundled the pieces of each individual dress, and sent the bundles to machine operators for sewing. After sewing, the garments were finished, pressed, and returned to the Silverman Company for a final quality check and proper labeling. Labels included the firm's label, "Shannon Rodgers for Jerry Silverman," the union label, fiber content and cleaning instructions, style and size, and the store label and price tag. Next came the firm's promotion and advertising to prepare customers for the new season. Once the finished garments had been shipped and received by the store, retail display, promotion, and advertising began. The salesperson and the customer at the point-of-sale completed the business process. By the early 1960s, manufacturers in the United States began to look for cheaper labor costs and production facilities off-shore. This resulted in a decrease in domestic apparel employment to 684,000 by 1999. It also resulted in a new focus on the logistics of coordinating off-shore production facilities where each part of an ensemble might be manufactured in a different country but is expected to reach the stores as a complete look. Modern communication and transportation make this kind of decentralized production process possible. Another significant change in late twentieth and early twenty-first century ready-to-wear is the importance of marketing strategies to product development. Procedures associated with a retailer acting as manufacturer, or jobber, for merchandise bearing the store's private label, offer an instructive comparison with mid-twentieth century processes. In the 1990s, beginning at least 15 months in advance of the arrival of the garments in the store, the design director, color specialist, and product merchandisers would consult color and textile services and view collections in Europe and America. Fabric specialists and product merchandisers then shopped for yarns and textiles at major textile trade fairs. The initial line concept including color, mood, theme, silhouette, fabrics, and key components was presented to the product management team. The design team planned their internal strategy and refined the line concept before they joined the product merchandisers to make a final presentation to store committee members and management. Samples were reviewed and target prices agreed to before trips abroad to select contractors. Five months before the products were due to be shipped, the line was finalized and contracts signed. The products reached the stores six to eight weeks from the shipping date. In order to track production at distant sites and cut costs even further, some mass-market firms use video-conferencing and other sophisticated technologies to send and receive information, thereby insuring product quality without the need to travel to the producer. As the time frame for fashion changes in ready-to-wear becomes more compressed, communication technology becomes more essential to success. Innovations in transportation, communication, and technology have been major forces for change throughout the history of ready-to-wear clothing production. Additionally, rapid fashion changes have influenced the modern apparel industry by compressing the production timetable. However, the production of ready-to-wear apparel has been consistently labor intensive, leading modern manufacturers to seek lower labor costs by repeatedly moving production facilities. Challenges faced by the industry in the early twenty-first century remain similar to those faced in earlier eras, particularly in the area of speculative production where the customer must be inclined to purchase at a price that yields a profit to the manufacturer. See also Fashion Industry; Seventh Avenue; Sewing Machine; Sweatshops. Arnold, Janet. "Smocks, Shirts, Falling Bands and Mantuas: Evidence of Loosely-Fitting Garments and Neckwear Produced for the Ready-to-Wear Market, c. 1560-1700." In Per una Storia della Moda Pronta, Problemi e Ricerche (A History of Ready to Wear, Problems and Research). Proceedings of the Fifth International Conference of CISST (The Italian Center for the Study of the History of Textiles), Milan, 26-28 February, 1990. Firenze: EDIFIR, 1991. CISST. Per una Storia della Moda Pronta, Problemi e Ricerche (A History of Ready to Wear, Problems and Research). Proceedings of the Fifth International Conference of CISST (The Italian Center for the Study of the History of Textiles), Milan, 26-28 February, 1990. Firenze: EDIFIR, 1991. Dickerson, Kitty G. Textiles and Apparel in the Global Economy. 3rd ed. Upper Saddle River, N.J.: Prentice-Hall, Inc., 1999. Druesedow, Jean L. "Designing for Off-shore Manufacture in the New York Ready-to-Wear Industry." In Per una Storia della Moda Pronta, Problemi e Ricerche (A History of Ready to Wear, Problems and Research). Proceedings of the Fifth International Conference of CISST (The Italian Center for the Study of the History of Textiles), Milan, 26-28 February 1990. Firenze: EDIFIR, 1991. Frick, Carole Collier. Dressing Renaissance Florence. Baltimore: The Johns Hopkins University Press, 2002. Kidwell, Claudia B., and Margaret C. Christman. Suiting Everyone: The Democratization of Clothing in America. Washington, D.C.: The Smithsonian Institution Press, 1974. Levitt, Sarah. "Bristol Clothing Trades and Exports in the Georgian Period." In Per una Storia della Moda Pronta, Problemi e Ricerche (A History of Ready to Wear, Problems and Research). Proceedings of the Fifth International Conference of CISST (The Italian Center for the Study of the History of Textiles), Milan, 26-28 February, 1990. Firenze, EDIFIR, 1991. Oppenheim, A. Leo. Letters from Mesopotamia: Official Business and Private Letters on Clay Tablets from Two Millennia. Translated and with an introduction by A. Leo Oppenheim. Chicago: University of Chicago Press, 1967. Rath, Jan, ed. Unravelling the Rag Trade: Immigrant Entrepreneurship in Seven World Cities. Oxford and New York: Berg, 2002. Seidel, Jutta Zander, "Ready-to-Wear Clothing in Germany in the Sixteenth and Seventeenth Centuries: New Ready-Made Garments and Second-Hand Clothes Trade." In Per una Storia della Moda Pronta, Problemi e Ricerche (A History of Ready to Wear, Problems and Research). Proceedings of the Fifth International Conference of CISST (The Italian Center for the Study of the History of Textiles), Milan, 26-28 February, 1990. Firenze: EDIFIR, 1991. Smith, Philip Chadwick Foster. The Empress of China. Philadelphia: The Philadelphia Maritime Museum, 1984. Tortora, Phyllis G., and Keith Eubank. A Survey of Historic Costume: A History of Western Dress. 3rd ed. New York: Fairchild Publications, 1996. Zhou, Yu. "New York: Caught under the Fashion Runway." In Unravelling the Rag Trade: Immigrant Entrepreneurship in Seven World Cities. Edited by Jan Rath. Oxford and New York: Berg, 2002.